ITx is kind of a big deal, ambitiously rolling twelve technology focused organisations and their respective conferences into one and as a result, becoming something of a Ted X for Wellington. The organisers have pulled it off beautifully, with the whole shebang culminating at the awards dinner held on the second evening of the three-day event. Just eight awards were made, despite the breadth of the conference, with Victoria MacLennan of OptimalBI Limited being named IT Professional of the Year. 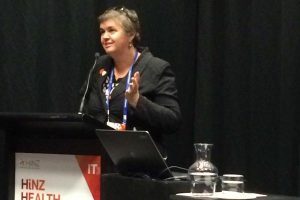 “The digital technology sector can be our number one export and it can enable the rest of New Zealand industry,” she said on receiving her accolade. Commenting on the supreme award winner, the judges said they felt MacLennan was “the epitome of the technology advocate”, working at all levels to elevate the development and use of technology in New Zealand. “She walks the walk and yet remains incredibly humble throughout,” they said. While the diversity of the tech sector can mean the levels of interest in one area don’t necessarily translate into another, there is no denying that the vast breadth of solutions, disciplines and specialties interact to a lesser or greater degree. That’s underpinned the success of the conference, which has drawn an estimated 1200 professionals from across the country to listen to a broad cross section of local and international speakers. Pokémon Go, which has captured mainstream media attention, was a recurring theme at the conference, with few presenters able to get through their Powerpoints without giving Nintendo a good mention. It might be a consumer plaything, but Pokémon Go does serve to illustrate the kind of ‘awesome’ that the industry is capable of. It’s a view shared by the likes of TUANZ (which is one of the organisations behind ITx) CEO Craig Young, who recently noted that while the tech industry itself is going gangbusters, there exists plenty of opportunity for digitisation of non-tech businesses across the country. Adding to that, SAP’s recent report confirms that a good deal of local companies are not yet delivering the sort of digital experiences that customers increasingly expect.